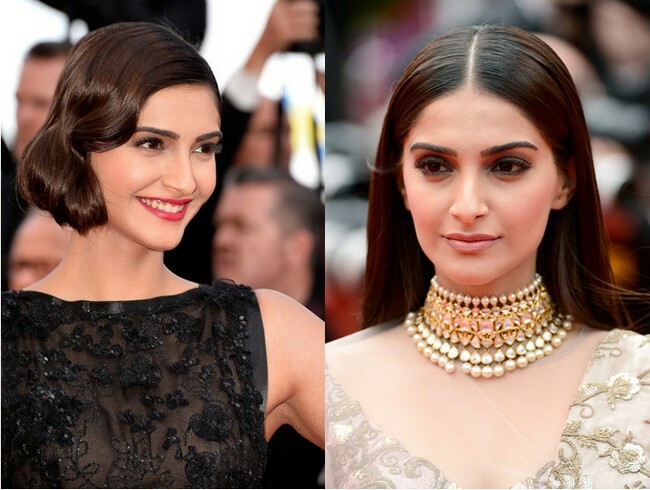 5 Amazing red carpet hair looks of Sonam Kapoor recreated in under twenty-minutes! Bollywood fashionista, actress and icon for the many PYTs that follow her, Sonam Kapoor is a figure we love to hate, and why? Simply because she’s well-dressed, eloquent and her grooming stance has sent us in a tizzy. This is why today, we would like to show you the Cannes favorite diva’s five amazing hairdos, which you can recreate at home. Take a look! Grab mousse and comb the hair with it, ensuring the hair is damp around eighty percent. This helps with the shine, sheen and luster needed. Section the hair from the middle into two parts, clip the front on two sides- left and right. Now take a portion of hair from above the left ear lobe and braid it, all the way to the end, and do the same with the hair above the right ear lobe too. you now have two ready braids. The hair in the middle should be combed into a sleek low bun and pinned. Around this bun, circle both the braids and pin them into the bun. Complete with a fixing spray to capture stray hair strands in front that flow. Fairly simple, the seventies straight sweep is an easy red carpet hairdo which can be worn at elegant parties and gatherings. For this style, you need to use a little hair mousse, applied all over the hair. Use a wide toothed comb to detangle the hair, and then with a hot blow dryer at an angle of forty-five degrees, blow-dry the hair straight. Do this for five minutes and then use a hair fixing spray to set the look. Comb gently with a paddle brush, and section the hair from the middle. Trust Sonam to sizzle up in a romantic wavy hairdo at the Cannes and to make it a trendy hairstyle too. To emulate this particular look under twenty minutes, we would need a bunch of hot rollers. Begin with applying hair mousse to make the hair volumnized and wet, and then sectioning the hair into two parts in front, three from the crown to the nape of the neck and two on the sides of the ear lobes. Each section should be rolled into the hot roller and kept for twenty minutes. Remove the rollers and with your fingers, brush the hair into a messy low waterfall hairdo. Pin the hair curls behind the ears with bobby pins and allow the rest to fall on the neck. Set the look with hairspray. Simple, chic and very classy, the cascading waterfall hairdo or the Lady Bunny avatar doesn’t take more than twenty minutes to do. Begin with applying hair mousse to make the hair volumnized and wet, and then sectioning the hair into four parts from the crown to the nape of the neck. Each section should be rolled into the hot roller and kept for twenty minutes. Remove the rollers and with your fingers, brush the hair. On one side of the head, use bobby pins to secure the waterfall look and brush the rest of the hair behind to come onto the other side. Fancy the vintage Great Gatsby hairdo but don’t want to shop your hair short? For this you would need to get your mousse ready and pin curlers too. Wet the hair with mousse and section the hair into three parts- the front, the crown and the nape of the neck. The hair in front should be side swept and with the help of pin curlers, put flat onto the scalp. With the help of a teasing brush, comb the hair on the crown section backwards and downwards towards the scalp to create more volume; roll the hair from down up and into the scalp and place bobby pins here to secure the hair into a flat low bun. The nape of the neck hair should be rolled onto the low bun above and secured with a pin. Come back to the hair in front which is side swept, and remove the pin curlers, and allow the hair to fall on one side over the ear. Set the whole look with hair spray! Go ahead and make each hairdo a red carpet statement for every occasion and event!